Welcome to February... Brrrrr it's cold. Our monthly newsletter provides news and helpful tips for our clients in Washington County, Maryland, and the surrounding area including: Hagerstown, Maryland; Williamsport, Maryland; Clear Spring, Maryland; Greencastle, Pennsylvania; and Falling Waters, West Virginia. Read more for more information on lawn mowing, lawn care treatments, landscaping, shrub trimming, shrub pruning, mulching and numerous other outdoor services. Just as mulch requires freshened up, so do our reviews. If you would like to give a review, please take the time to post your review online, or send directly to Tom. Thanks so much for sharing your feedback! We also like to keep our clients well informed on what to be on the lookout for, and what should be done at certain times of the year to be scheduled for the proper services. Please feel free to share/forward Grosh’s Grass Gazette with your family, co-workers, on social media and with your friends and neighbors. Grosh’s Lawn Service offers a premium lawn and landscape program for clients who are looking to have their property cared for, year-round, at an incredible value! Your property will always look its best when you select the premium program; everything is covered. To learn more about the services offered in the premium lawn and landscape program, click here. 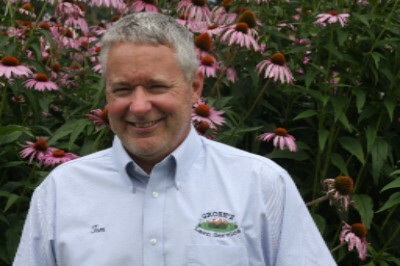 Email Tom today to schedule the 2019 premium lawn and landscape program. For a complete list of services, be sure to check out our blog. The month of February is a great time to have trouble areas, such as wild trees and wild vines, trimmed and removed before they germinate new growth. Waiting only makes the task more difficult, time consuming, and costly. Check out our brush cutting and brush removal services and then e-mail Tom now to schedule your brush cutting project. Grosh's Lawn Service Tip of the Week here for landscaping, lawn care and tree and shrub tips and information each month. HAVE YOU ACCEPTED YOUR ESTIMATE? While it may not seem like it, each day brings a little more sunshine and daylight. At Grosh's Lawn Service we are looking forward to spring! It will not be long before we will see the crocuses blooming, and hear the birds chirping once again. With spring right around the corner, we are getting ready to help our clients' lawns and landscapes look their best. Thank you to everyone who has already accepted our 2019 estimates for continued services. You are now on our schedule and good to go! Have you accepted your 2019 estimate(s)? If not, please accept quickly, as we want to make sure you are on our schedule (which fills up pretty quickly). Simply click the https://www.groshslawnservice.com/accept-now.php link for your 2019 estimates. Will the groundhog see its shadow predicting six more weeks of winter (Pennsylvania Dutch Superstition) or if it does not see its shadow due to cloudiness spring will arrive early? Make sure you take time to show your loved ones how special they are to you this Valentine's Day. Presidents' Day on Monday, February 18th. 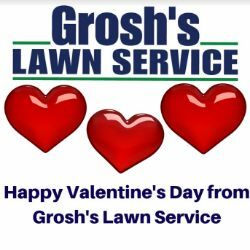 As we look toward spring, we want to take a moment and thank you for working with Grosh’s Lawn Service in 2019. We look forward to a wonderful year caring for your lawn and landscape needs. Please schedule your spring cleanup today so that your lawn and landscape beds at your home, office, church, or commercial properties are ready for spring blooming trees, flowers, and shrubs. Your lawn will also then be ready for a crabgrass preventative treatment and eventually for lawn mowing to begin in April. Are you interested in having your outdoor area more inviting to birds and butterflies? Are you looking for an outside area where you can go for peaceful solitude? From fountains and flowers to butterflies and birds, homeowners are getting in touch with nature by making their home landscapes more inviting and tranquil. Be sure to read Lisa Tedrick Prejean's article, found here, to learn more. Nothing makes it feel more like spring than seeing blooming trees, flowers, and shrubs stand out in fresh mulch. Make sure that you do not delay in signing up for spring mulching for your home, office, or commercial properties. Want to learn more about the benefits of mulching? 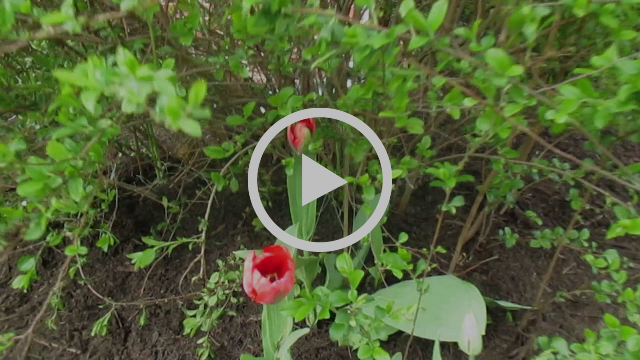 Check out this post on the Grosh's Lawn Service blog and watch the YouTube video below. Email us now to schedule your spring mulching service. Make sure your lawn is ready for the 2019 growing season by enrolling in the Grosh's Lawn Service lawn care treatment program. This program will ensure that your lawn is properly cared for, all season long. For example, did you know that crabgrass is one of the season's first lawn hassles? Timing is everything when dealing with this lawn nuisance. If your lawn is not on our treatment program, be sure to email Tom today to enroll in this service. Be sure to check out our 2019 Lawn Health Care Program, as well. Grosh’s Lawn Service is pleased to announce that we have updated our commercial grounds management page. Please take time to look over our new web page, and if you know of any business, church, etc. 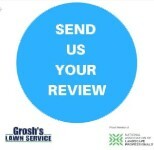 looking for commercial grounds care, please refer Grosh’s Lawn Service. Listed on the page are some of the many commercial properties we have serviced over the last 29 years. 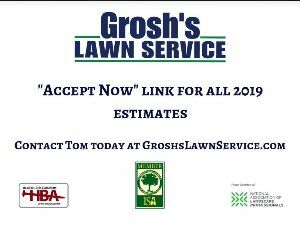 Tom and the team are extremely humbled, when looking at the commercial work list, to see how much Grosh's Lawn Service has been blessed by God. Grosh's Lawn Service is committed to giving back to the communities where we live and work. 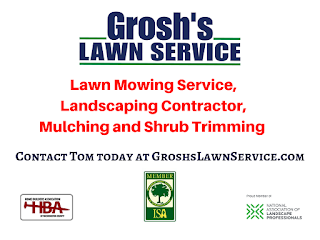 Since our beginning in 1990, Grosh's Lawn Service has given at least 5% of profits to local communities in Washington County, Maryland, and surrounding areas. We are doing our part to continue making the Hagerstown, Maryland, area a wonderful place to live. We believe in helping our community and sharing our blessings with others. We have been blessed and want to share our blessings with others. That way, we all profit! 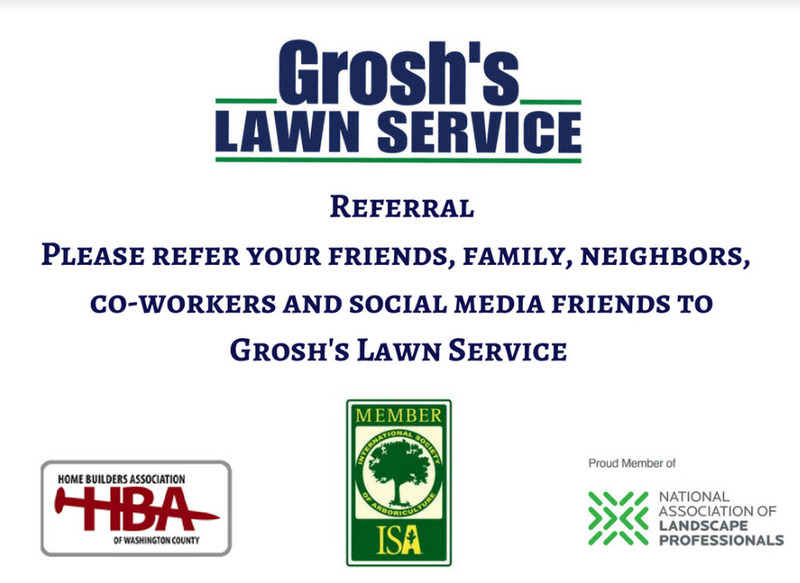 If you know of any family member, friend, co-worker looking for lawn care, lawn treatments, and landscape service, please refer Grosh’s Lawn Service. When your referral signs up for one of our services, Tom will send you a gift card to a Hagerstown, Maryland, area restaurant. Copyright © 2019 Grosh's Lawn Service, All rights reserved.